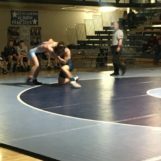 Cimarron, Kan. (westernkansasnews.com)–Wrestling in their regular season finale on Thursday night, the Scott City wrestling team made the trek to Cimarron to wrestle the Bluejays. It would be a match up that not only would give the teams some confidence into regionals next week, but also be the only time the two schools would see each other this year. The Beavers would continue their winning ways as a dual team, as they completed their second 9-0 dual record in as many seasons, winning 63-15. Scott City would receive three opens, but also won eight out of 11 head-to-head matches. Also wrestling were six junior varsity matches and in between the high school matches, 16 matches featuring future high school wrestlers from the Scott City Takedown Club and the Gray County Wrestling Club. Scott City will be at the Class 4A Regional Tournament in Pratt next Friday and Saturday, February 15-16, and Cimarron will head to WaKeeney for the Class 3-2-1A Regional next Friday and Saturday.